Mumbai is under a terror attack right now. 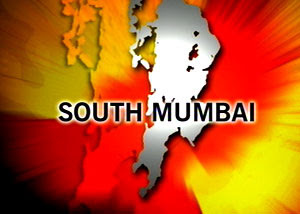 The attacks started at around 10 pm at south Mumbai according to the news reports that started coming in on TV. The Oberoi Hotel in Nariman Point was under heavy firing from inside and two blasts were heard. Fresh Update: This is the Taj Hotel in Mumbai, a prominent landmark in South Mumbai just opposite the Gateway Of India, is the place where some terrorists at present are still holed up with hostages and the top story of the Hotel is on fire which is being doused out by the firefighters. The fire has been raging inside the hotel since last night when some blasts had occurred near the dome of the hotel. There were reports of firing with AK-47 rifles at random by some unidentified people in the Leopold Cafe in South Mumbai in Colaba, Mumbai. This was the first place from where we heard about the firing occuring. Slowly, news reports also came in from firing also happening in the CST station, Churchgate station, Worli, Napean sea road and also a blast in Vile Parle. There are also reports of Hand grenades being fired at the police vans from Colaba Causeway. Few people have been injured and taken to hospitals nearby, Mainly Kama hospital in Mumbai, Colaba is also been targeted. The fresh news reports are coming in even now. Mainly, Oberoi Hotel in Nariman point and the Taj hotel in Colaba seem to be the central point of the encounter that is happening. I myself heard two blasts that had occurred a little while ago, reportedly from the Oberoi hotel area. The police still seem to have no clue as to what is happening and who is behind all this chaos that's going on and why. Apparently 3 poeple have been killed (died) in Taj Hotel. Police have surrounded all the areas in Colaba and local trains from CST have been stopped. Two grenades have been fired at the police in the Taj area. The latest news is that the terrorists have planted some bombs in the Taj Hotel and the police are now trying to get the bomb squad to try and locate the bombs and diffuse them, if possible. The terrorists are apparently in the Old Taj building and have grenades that they are throwing at the police. Whole Mumbai is now under Red alert as more and more news of such attacks from other areas are coming in. More and more people are getting injured as the situation is progressing. The injured are being taken to GT Hospital in Colaba. Video reports from Oberoi Hotel shows people at their room windows, trying to escape. Some are standing on the ledge of the windows. Police are confused as to who they are. Police is trying to identify them by a flash light, but can't see clearly if they are residents of the Hotel? News reports from CST just in that the firing still going on there too. The terrorists have taken over a bogie of a train and are firing from there. About 10 people have been reported as dead in CST. Update: A petrol pump has been blown up in Colaba near market area. And reports are that these people who are firing are not running away but are holding their posts and continuing to fire away. Mumbai is definitely under siege and looks like they have an agenda. Now what exactly is that nobody knows. Two loud explosions have been heard from the CST station recently. Fresh reports from Oberoi Hotel says that the lobby of the hotel was on fire and two explosions from hand grenades were heard. According to the news reports on TV the terrorists have now got 15 British residents as their hostage and Commando operation is now under way at the Oberoi Hotel. Let's see how the situation develops further..
As of now there are three places that are under siege still by the terrorists, namely the Taj Hotel, Oberoi Hotel in Nariman Point and the Nariman House in Colaba Causeway. The NSG commandos have arrived from the Capital and are now trying to smoke out the terrorists from these buildings. Schools and colleges have been closed today and the whole areas surrounding these buildings have been cordoned off by the police. The situation is still tense as Mumbai is burning today morning. There is a severely injured and bleeding man inside the Taj Hotel who requires urgent medical attention, but they are not able to get him outside. Hospitals namely, the JJ hospital and GT hospital in Mumbai are falling short of blood as more and more victims are being brought in since the incident started around 10 PM last night. 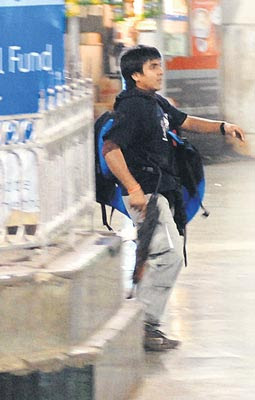 This is the "exclusive first picture of the gunman seen by the times reporter of one of the terrorists at cst station taken by the photo editor Sebastian D’Souza from barely a few feet away".